ACCESSORY TRAY: This anti gravity chairs are equipped with durable plastic accessory tray providing perfect place to set drinks, magazines, phones tablets, or other small items for convenient accessibility. Our zero gravity chairs can help you release all the pressure and let your body fully relax without any pressure on your spine. 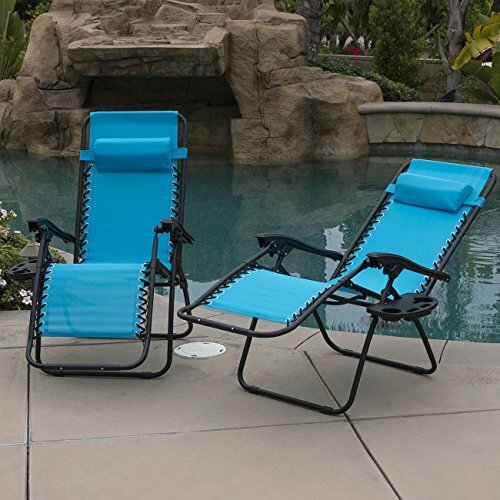 NO GRAVITY: Durable yet lightweight frame, Textilene Fabric removable adjustable headrest and padded, super elastic strands form the basis for this comfortable, stress relieving No gravity folding chair. SPACE SAVING: Textilene features UV resistance with over 80% sun protection for a long lasting and durable chair that will last many seasons. Rust resisted Frame Durable & Quick drying Mesh Lock in any Position Space Saving place. FUNCTION: Easily and safely glide to recline from upright to the zero gravity position. Each Set includes a removable pillow, a phone holder and a detachable cup holder that can support 2 beverages, a phone. KNOB LOCK: Elevates your legs horizontally which improves blood circulation. Supports up to 300 lbs. Zero Gravity Outdoor Lounge Chairs constructed with Quick drying mesh and a sturdy steel frame. Simple Twist knob, relax with the smooth recline function that locks in any position, adjustable headrest or lumbar support.